As new technologies, procedures, and materials emerge, dentistry is becoming easier, more painless, faster, and more effective than ever before. Just look at the dental crown, for instance. A procedure that once required multiple trips to the dentist chair can now be performed in a single day at the right office. If you’re lucky enough to live in Lee’s Summit and need a crown, then Dr. Caye’s office is the place to go, because Premier Dental has the latest CEREC crown technology to provide you with same-day crowns. Starting with the Basics: What Is a Dental Crown? A crown is a protective cap that gets implanted on a damaged or decayed tooth. The purpose of the crown isn’t just cosmetic but also practical, because it will allow the damaged tooth to function normally again and prevent it from becoming more damaged. Although crowns are highly effective, having one put in typically requires multiple appointments over several days or weeks. At your first appointment, the dentist will file down the damaged tooth, take an impression of your mouth, and place a temporary cap on the tooth. When the permanent crown is ready, you’ll go in for the second appointment to have the temporary cap taken out and the permanent one put on and sealed in place. 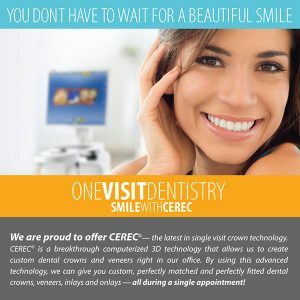 At Premier Dental, we know that you don’t have time to come to the office for multiple visits when you need a basic procedure like a crown, and that’s why we’ve embraced CEREC technology. Thanks to this device, you can have a permanent crown fitted, created, and seated in a single visit. No uncomfortable dental implants, no fiddling with a temporary crown, and no return visit to have the permanent crown put on. You will be in and out of the office in a single day with a complete and permanent CEREC crown. Dental crowns are great when you’ve got a damaged tooth that needs a new protective layer, but traditional crowns can take weeks and multiple appointments to get. When you’re looking for tooth replacement options, CEREC crowns are the ideal solution because they’re fast, effective, durable, and natural looking, and you’ll be in and out of the dentist chair with a brand new crown after a single visit. And because you only have to come in for a single appointment, you’ll also save money, meaning you’ll leave with more cash in your pocket and the smile you’ve been dreaming of. Dr. Stephan Caye and his friendly, experienced team at Premier Dental offer affordable family dentistry and tooth replacement options in the Lee’s Summit, MO area. Our office is conveniently located off of Highway 50 and SE Blue Parkway. We offer appointment times Monday through Friday to meet your needs. At Premier Dental, we provide most dental health services, from family and general dentistry to specialty procedures, including endodontic or root canal treatment, teeth whitening, cosmetic dentistry, emergency dental care and much more. We accept most dental insurance plans and offer affordable financial solutions for any budget. Please call us at (816) 600-6330 to schedule an appointment.